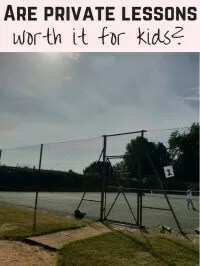 I loved playing in sports teams when I was a child – from secondary school I did hockey and netball, plus a bit of basketball later on, as well as playing in tennis and squash teams. 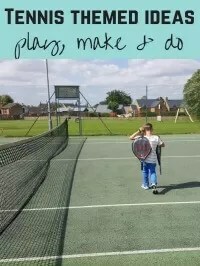 I think it’s so important for children to be part of a team (and that could be sports or non-sporting teams like choirs or orchestras) because they learn so much from them. N loves playing his tennis which is largely individual focused. But luckily they play as a team in a mini red league team which means they get to learn about team spirit and support. Young children find it easier to get over the ‘being new’ feeling. Hopefully turning up as a team is less daunting than being on your own. N played his first team matches last term. From October to December they struggled to put out a full team – as with his school, there’s a shortage of girls, willing or able to play matches. So even though there were a couple of matches they won in terms of games, they lost overall having to forfeit number 4 matches due to a missing girl or person altogether. N had quite a successful season – winning many more than he lost, and the most successful in the team. But there were a couple who’d not won any and he was also learning to empathise and check his team mates were ok and ready for their next match. 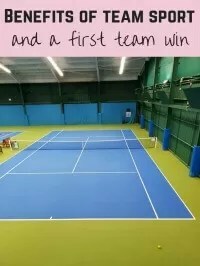 This term is a new season of tennis, and their league group is similar to before. They’ve only got 3 teams to play, 2 of whom were teams they ‘beat’ (on games played) in last season. The 3rd team was new to their group but from a bigger club. An unknown entity and it turned out a similar standard to N’s team. Being second season they’ve played has made a difference to our team. They’ve more confidence as they’ve got some match play under their belt. They know 2 of the teams are beatable. The 4 who played the first match of the season all go to school together and get on brilliantly. It also meant that between rubbers they could relax and not worry about what had gone and what was coming up. It helped them relax and give each other a boost in positive thinking. N and I also did our usual pep talk so hopefully that helped his friend put less pressure on himself. Mini red is about match experience and having fun. We’re working as a team so support each other. Once they arrived and met the rest of the team, they were fist pumping and saying good luck and congratulating as they came off court. In the past they’ve not had as much of that. We’ve mixed up the teams with some kids who they only know from tennis, and others who were just brought in for 1 match but aren’t really part of the group sessions. That throws in other dynamics and personalities, and it’s harder to know what makes them tick in the team. I was pleased as one of the other parents is someone who’ll also do scoring. It means we could each watch our own child’s matches, and alternate the scoring responsibility. The children did really well. 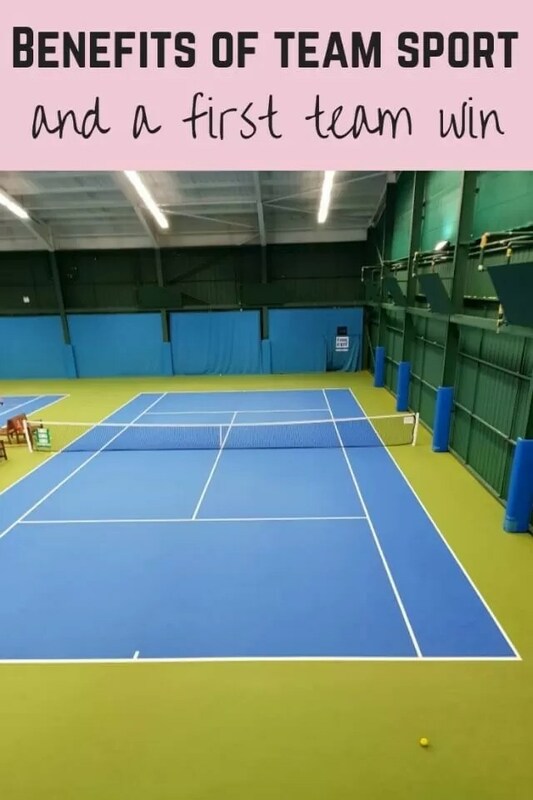 For under 8s mini red tennis they play 3 rubbers each, 2 singles (number 1 and 2, play those in the opposing team, and 3 and 4 rankings play each other), and 1 doubles. All of the children won 1 singles and 1 doubles. N scrapped for his 10-9 win – which he often does, although this time he was full of cold so did well to finish it off. Then we won both of our doubles. With bonus points for having a team sheet, scorer and a full team including at least one girl, N’s team won 9-6. Their first team win. They were so excited to hear their names called out, mistakenly thinking they’d won across all 4 teams playing in their group. 1 match at a time I think. It took a bit of calming them down. A couple of photos taken to send to the tennis coach who couldn’t make it that day, and time to head home. Sometimes it just takes one win to boost the team. Their little touches of team spirit – the doubles teams chatting and relaxed between points, helping each other with where they should be standing and watch outs. Their happy go lucky banter between games. It’s all of those which make them want to continue playing as well as them wanting to win. Hopefully they’ll be able to maintain their team spirit when there are team switches. 1 win down, 2 matches to play. Do your children play in sports teams? How do they get on with them? When's a baby not a baby? I can definitely see the benefits of team sports like this for children (and adults). My kids’ sport at the moment is karate, and then it’s interesting seeing them try and discover new sports. My son’s started to take more of an interest in football at the moment, so I can see that developing, and my daughter’s just started hockey and seems to be enjoying it so far. She tried football for a time, but gave it up, and interestingly it was the team and friendship side that she enjoyed the most.